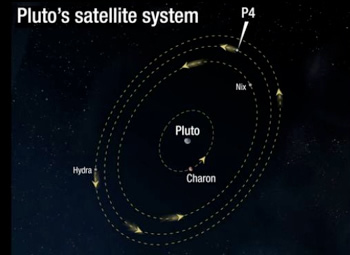 Pluto's newest found moon, P4, orbits between Nix and Hydra, both of which orbit beyond Charon. Could there be still more moons of Pluto? Perhaps, and the New Horizons team plans to look harder to ensure that we don't run into something that could damage or destroy New Horizons. New Horizons remains healthy and on course, now almost twenty two times as far from the Sun as the Earth is, and approaching six years into its 9.5-year journey to the Pluto system. We’ve taken the spacecraft out of hibernation to perform maintenance activities, and to re-point our radio antenna to compensate for Earth’s movement around its orbit. This “hibernation wakeup” started November 5 and will last until November 15. Then New Horizons will hibernate again until early January, when we’ll perform a more extensive, almost month-long wakeup. If you’re wondering what I mean, I’m referring to the fact that the more moons that pop up in the system, the more we have to worry that there are still more undiscovered moons that are too small and faint to detect. When we discovered P4 this summer, along with possible evidence of a couple of still-fainter moons (something we need more study to confirm or reject), we began to worry about just how many tiny moons Pluto might have and whether we might have to dodge them. Even more worrisome than the possibility of many small moons themselves is the concern that these moons will generate debris rings, or even 3-D debris clouds around Pluto that could pose an impact hazard to New Horizons as it flies through the system at high speed. After all, at our 14-kilometer-per-second flyby speed, even particles less than a milligram can penetrate our micrometeoroid blankets and do a lot of damage to electronics, fuel lines and sensors. So to assess that hazard, we brought together about 20 of the world’s experts in ring systems, orbital dynamics and state-of-the-art astronomical observing techniques to search for small satellites and rings at distant Pluto. 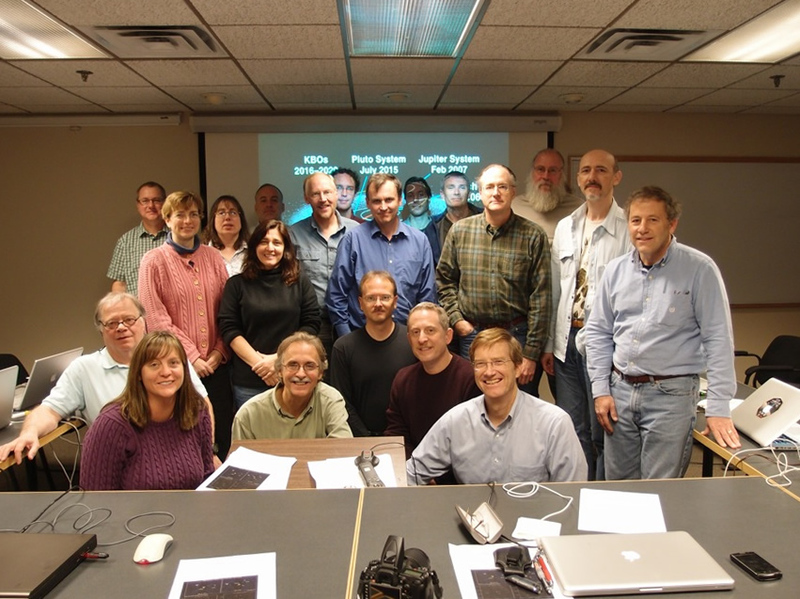 This group convened November 3-4 at the Southwest Research Institute’s offices in Boulder, Colo., where the New Horizons science team is centered. During this two-day workshop, a series of technical talks and discussions sections examined every aspect of the hazards that debris and small moons orbiting in the Pluto system might pose. 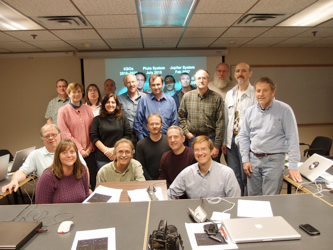 The presenters and attendees of the New Horizons Pluto Encounter Hazards Workshop on November 4, 2011. We found a plausible chance that New Horizons might face real danger of a killer impact; and that to mitigate that hazard, we need to undertake two broad classes of work. 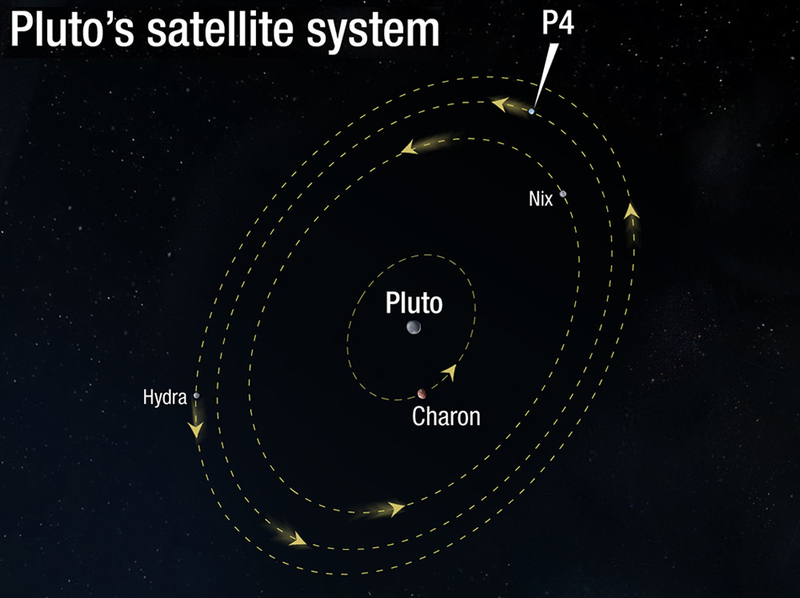 First, we need to look harder at the Pluto system for still undiscovered satellites and rings. The best tools for this are going to be the Hubble Space Telescope, some very large ground-based telescopes, telescopes that can make stellar occultation observations of the space between Pluto and Charon where New Horizons is currently targeted, and thermal observations of the system by the ALMA radio telescope array just now being commissioned. Then, we need to plan for an alternate, safer route through the Pluto system in case those observations reveal strong evidence that our current trajectory is too hazardous. Studies presented at the Encounter Hazards Workshop indicate that a good “safe haven bailout trajectory” (or SHBOT) could be designed to target a closest-approach aim point about 10,000 kilometers farther than our nominal mission trajectory. More specifically, a good candidate SHBOT aim point would be near Charon’s orbit, but about 180 degrees away from Charon on closest-approach day. Why this location? Because Charon’s gravity clears out the region close to it of debris, creating a safe zone. The question of whether the Pluto system could be hazardous to New Horizons remains open –but one we’ll be studying hard over the next year, with everything from computer models to big ground-based telescopes to the Hubble. I’ll report on results as we obtain them, but it is not lost on us that there is a certain irony that the very object of our long-held scientific interest and affection may, after so many years of work to reach her, turn out to be less hospitable than other planets have been. We’ll see. 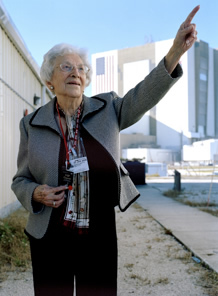 In closing, I want to add a timely note and wish Patsy Tombaugh, the widow of Pluto discoverer Clyde Tombaugh, a very happy 99th birthday today (November 7). 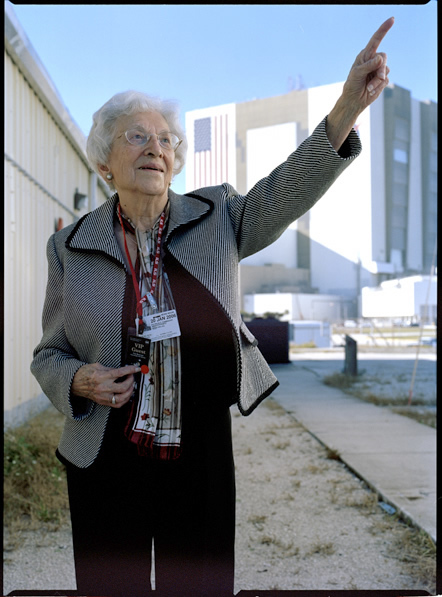 As Patsy begins her 100th year, we on New Horizons marvel at her longevity, her energy, and her wonderful sense of humor. Happy birthday Patsy! Well, that’s my update for now. Thanks again for following our journey across the deep ocean of space to a truly new frontier. And I hope you’ll keep on exploring – just as we do!